I absolutely love cooking with my slow cooker because I don’t have to think about anything. 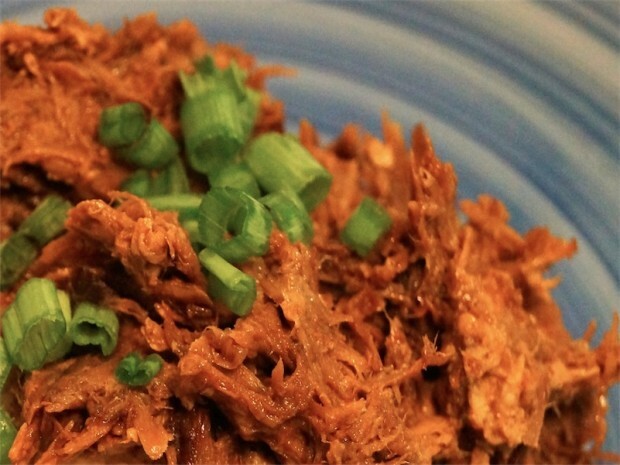 Throw a bunch of ingredients in the crockpot and later on that day you have a delicious meal. This meal is a healthy twist on one of my favorite Asian dishes – Char Sui pork. The pork cooks low and slow for eight hours and turns out incredibly tender and delicious. Eat it on it’s own, with veggies, in lettuce cups, or wrapped up in a low carb tortilla. There are lots of possibilities for this recipe and it makes enough to try them all. 1. Mix up all the ingredients in a small bowl except the pork. 2. Add the pork to the crock pot, cover in sauce, and let cook for 8 hours on low. 3. Shred the pork with a fork and let sit in the crock pot for 15 minutes with the lid off. Serve on its own, over cauliflower rice, steamed veggies, or as yummy Asian inspired tacos with no carb tortillas depending on what phase you are in.